Embedded with U.S. troops in Afghanistan, CNN's Nick Paton Walsh captures U.S. troops in action as a military outpost in Taliban territory comes under fire Tuesday and Wednesday. 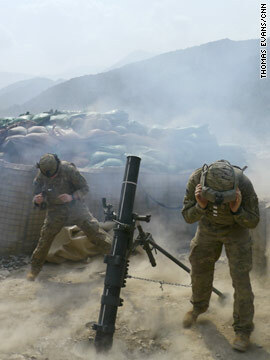 U.S. troops use mortars first on Tuesday, aiming for Taliban dug into the hills. Machine guns rattle through the air. But the incoming fire on U.S. Combat Outpost Pirtle King is very accurate. Then, four massive airstrikes, as U.S. jets strafe the hills. The Taliban falls silent. The next morning, it starts again - mortars and RPGs pound the base, and for the second time in 24 hours the base is under attack. On Afghanistan's eastern border, Kunar Valley is vital strategically. If the Americans leave, militants from Pakistan will flow through the valley. If they stay, then every few days, attacks like those on Tuesday and Wednesday happen. CNN's Tommy Evans grabbed these photos as a mortars and RPGs pound a the U.S. Combat Outpost Pirtle King in Afghanistan near the Pakistan border. Eight militants and 10 others are dead after a brazen, carefully-orchestrated attack on a Kabul hotel that the Taliban has claimed responsibility for, officials said Wednesday. Two police officers are among those killed in the attack that began late Tuesday night and carried into Wednesday at the Hotel Inter-Continental, according to the Afghan Interior Ministry.